The Mount Washington Hotel was the scene of the monetary conference. 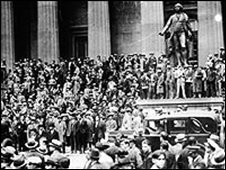 In the summer of 1944, delegates from 44 countries met in the midst of World War II to reshape the world's international financial system. 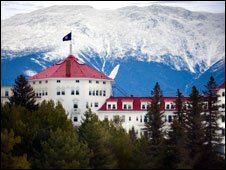 The location of the meeting - in the plush Mount Washington Hotel in rural Bretton Woods, New Hampshire - was designed to ensure that the delegates would have no distractions, and no pressure from lobbyists or Congressmen, as they worked on their plans for post-war reconstruction. The meeting was born out of the determination by US President Franklin D Roosevelt and UK Prime Minister Winston Churchill to ensure post-war prosperity through economic co-operation, avoiding the economic conflicts between countries in the 1930s that they believed contributed to the drift to war. 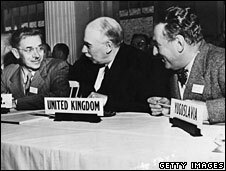 The principal negotiators at the meeting were the US, represented by the US Treasury's Harry Dexter White, and the UK's John Maynard Keynes, who was serving as UK Treasury adviser despite declining health. 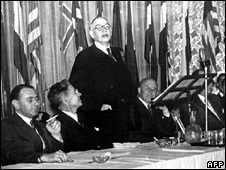 And chairing the proceedings was Henry Morgenthau, the US Treasury Secretary, from the only country that was likely to emerge from the war with a strengthened economy. President Roosevelt told the conference: "The economic health of every country is a proper matter of concern to all its neighbours, near and distant." The meeting was part of the process led by the US to create a new international world order based on the rule of law, which also led to the creation of the United Nations and the strengthening of other international organisations. The delegates focused on two key issues: how to establish a stable system of exchange rates, and how to pay for rebuilding the war-damaged economies of Europe. And they established two international organisations to deal with these problems. The International Monetary Fund was set up to enforce a set of fixed exchange rates that were linked to the dollar. Countries in balance of payments difficulties could receive short-term help from the IMF to avoid devaluation, and it could sanction changes in exchange rates when necessary. The World Bank (officially the International Bank for Reconstruction and Development) was set up to make long-term loans "facilitating the investment of capital for productive purposes, including the restoration of economies destroyed or disrupted by war [and] the reconversion of productive facilities to peacetime needs". 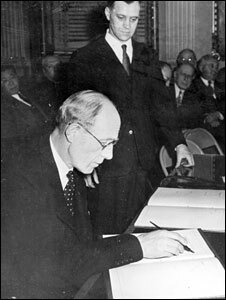 A third organisation, the International Trade Organisation, designed to encourage free trade, was still-born when the US refused to ratify its charter in 1947 - although tariff reductions were pursued through the Gatt treaty later. However, more ambitious proposals from the UK's John Maynard Keynes to set up a world central bank which could issue its own currency (which he called bancor) were rejected by the US. Keynes hoped a new bank could help reflate the world economy by expanding the money supply. He also wanted the cost of adjustment shared between countries with trade surpluses and deficits, so that countries with big surpluses would have to revalue their currencies, as well as deficit countries being forced to devalue. Instead, the Bretton Woods system gave the US currency - which was linked to gold - the dominant position in the world economy and allowed the US to run a trade deficit without having to devalue. And the US, which contributed the most money to both institutions, also gained the most voting rights, giving it a veto over major policy decisions. The establishment of a rules-based system of international finance helped restore confidence in the world economy and led to an extraordinary boom in the post-war years. The US also helped the European recovery by contributing additional funds through the Marshall Plan when the World Bank's efforts proved inadequate. World trade among developed countries grew rapidly in the 1950s and 1960s, boosting world output and raising the standard of living, especially in Europe and Japan. The US, still by far the richest country in the world, was happy to provide export markets for its allies, and sent dollars abroad through military and civilian aid which helped lubricate the wheels of commerce. Meanwhile, the focus of the World Bank gradually shifted to helping developing countries with the establishment of its special low-interest loan arm, IDA. However, by the 1970s, the US currency was under pressure from a combination of factors, including the cost of the Vietnam war and the growing trade deficit. In 1971, the US under President Nixon unilaterally went off the gold standard and devalued the dollar, a move ratified by the Smithsonian Agreement later that year. This led to the abandonment of fixed exchange rates and the introduction of floating rates, where the value of all the main currencies was determined by market trading. Attempts to forge a new Bretton Woods agreement on currencies in the 1970s failed, although the IMF still retained its role of helping countries cope with major currency crises - including Britain in 1976. The breakdown of Bretton Woods had two consequences. On the one hand, it led European countries to begin seriously considering closer monetary co-operation, which ultimately led to the creation of the euro in 1999. And it led to the creation of the G7, the informal group of the world's leading economies, which helped to coordinate currency adjustment in the Plaza and Louvre Accords in the 1980s. On the other hand, the end of the Bretton Woods system unleashed two decades of financial globalisation, encouraged by the deregulation not just of currency markets, but also of rules about banking and investment. The rapid reversal of such private sector flows when currencies were threatened with devaluation was the central cause of the Asian financial crisis in 1997-98, which spread to Russia and eventually Argentina. The resources of the IMF proved inadequate to compensate for the run on their currencies, and the adjustment proved painful, with sharp falls in GDP. Since then, many Asian countries, including China, have accumulated large currency reserves to insulate themselves against future crises, avoiding the need to call on the IMF. The latest world financial crisis, which has hit the richest countries hardest, has renewed calls for a new global framework of financial regulation. But the task this time will be far more complex, with the proliferation of financial instruments and the fact that there is no longer one country that dominates the world economy in the way the US did after World War II. And the political impetus for co-operation is less compelling today than it was in 1944, after a decade of war and depression. Any new agreement would have to recognise the power of the rising economies, such as China and India, and reshape the institutions created more than half a century ago. Such changes are not likely to be either quick or easy.